Bjarki, Skee Mask, Efdemin & more, PLUS Elle Vulf Gate 89 Guest Mix! Alex Martinez and Carmen Moreno! April 21, 2019 | 3:00 p.m. Guests from the Lyric Opera discuss their production of "The Pearl Fishers", and folks from The Barn Players come in for a chat about their production of "Grand Hotel". The Greater Kansas City Black History Study Group’s, Vice President, Dr. Cecelia Robinson, President Emeritus, Dennis Robinson and Corresponding Secretary, Brenda Vann share the work that they are doing to highlight the richness of our history. Looking to make a tax-deductible donation for 2012? Think KKFI, your non-profit community radio station. December 17, 2012 By KKFI 90.1 FM Comments Off on Looking to make a tax-deductible donation for 2012? 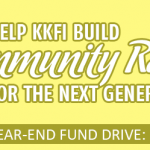 Think KKFI, your non-profit community radio station.